Jamaica Reggae Music Vacation Lovers presents Snorkeling in Jamaica which is a swimmer's and diver's chance to see reefs filled with soft and hard coral, brilliantly colored sponges, fishes, octopuses, sea stars and even some nurse shark. Conditions for diving is exceptional within the warm Caribbean sea offering tremendous visibility and even more treasures to be seen in shallow reefs, caverns and trenches. Snorkeling in Jamaica is such a fun activity, that allows you to observe vibrant underwater life in there natural settings, free from any equipment or the need for any type of certification. All along the north coast of Jamaica you'll find caverns, trenches to walls and drop-offs to shallow reefs. Dives in Jamaica must be guided and are restricted to depth of 30m. This is for your safety and enjoyment, so please observe this rule. Of special interest to snorkeling in Jamaica is the Point in Montego Bay where there is a dive wall known for its dense corals, masses of coral canyons, caves and tunnels, marine life of fishes of different species, nurse sharks, barracuda and stingrays. Snorkeling at night can be very rewarding since there are some creatures that only come out at night. So you'll need underwater lights for this expedition and there are some dive shops in Jamaica that offers such a expedition. Remember even at night the water is still warm so you'll enjoy your dive. Read more about unlimited scuba diving at Sandal Resorts. Snorkeling in Jamaica is a year round activity, so start planning your trip to the jewel of the Caribbean now. It is always nice to have your own snorkeling mask , because then it fits you well, does not leak, it is sealed on well and not dropping off your face. But if you do not have your own then the resorts or the tour group you are going snorkeling with are usually well prepared. Technology has even caught up with snorkeling mask now and have a dual tube system that allows for separate inhalation and exhalation passages. Or there is the mask where you re-breath some of your previous breath which is trapped or remained within your tube. Everything is now technology supported in making this fun activity as safe as possible and simply amazing. An ill-fitting fin can cause blister on your toes, so make sure and wear one that fits you well. Fins helps you to glide much faster and is such a beautiful sight when you see a diver just gliding by. Read the full report from the Jamaica Observer on the outstanding performance of Celine Dion and her praise of Jamaica's culture, food and love shown to her. All the performers at this year's Jamaica Blues and Jazz event were excellent so start planning to attend next year. The Rt. Hon. Robert Nesta "Bob" Marley, O.M. birthday will be celebrated from February 5, through to February 12, 2012. His influence in bringing reggae to the international stage is still being felt. Read here for more information on this week long celebration. Prince Harry plans to visit Jamaica in March to meet our newly elected Prime Minister, Portia Simpson Miller and also meet with the world's fastest man Usain Bolt for some pointer in running, as part of the Queen of England sixty year reign. What an honor for Jamaica and Usain. <>, we are making grilled snapper fillets, instead of fried snapper - which is what most Jamaican eat, but is just as spicy and tasty with a nice little kick. Mix together 1/2 cup chopped fresh thyme, chopped fresh rosemary, squeeze one lime juice and tablespoon olive oil. Wash snapper fillet, drain then place in marinade, spread mixture all over fish then cover and set aside in fridge overnight. Or if you are in a hurry let sit for at least one hour on your kitchen counter top. Next saute peppers, onion and garlic in tablespoon olive oil and set aside. Then spray nonstick pan generously with olive oil and grill both sides of snapper fillets, season with salt and black pepper until browned. Add sauteed peppers, onion and garlic on top of fish and reheat. Again thank you for subscribing to this month's newsletter of Snorkeling in Jamaica. 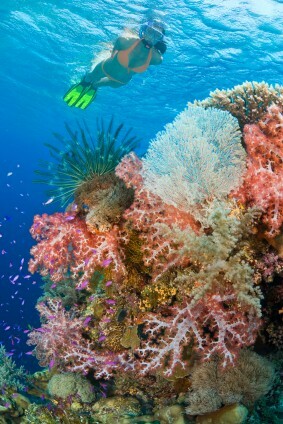 We hope to see you snorkeling around our reefs.